UK To Spain Removals - Why Are Furniture Covers Important? UK to Spain removals involves a lot of upheaval. Not only are you moving to an entirely new country with a different language, different culture and different customs, but you have to take everything you own with you too. It can be a struggle, with the multitude of things to consider before you go. Do you move to a city? for instance a removal to Zaragosa? or maybe to a small town or village. One of the most important considerations during removals to Spain from UK is how to keep your precious belongings safe and secure. It can be hard enough ensuring that everything is protected during a move from one place in the UK to another. When it is time to go overseas, who can you trust that your possessions are not going to come to any harm? One way is to speak to your removals to Spain company about furniture covers. There are various different types of furniture covers, but they need to be robust enough to ensure that no harm or damage will come to your precious furniture. It should not be your job, as a customer, to buy these covers � rather, your removals company should already have them as part of their inventory for moves. Before booking with a removals company to transport your belongings to Spain, ask them for details about the furniture covers they use. If possible, you should be able to see and feel them, or at least have detailed description, to know that they are as good quality as you need them to be. If not, simply search for another company that can guarantee protection for your furniture. 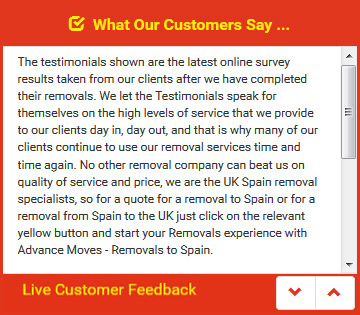 For the best in UK to Spain removals, go to Advance Moves (http://www.advancemoves.com/). We have experience in moving thousands of clients to Spain, and we know the difficulties that need to be overcome to make a move successful. Email us at info@advancemoves.com and we can answer all your questions. Polythene furniture bags are used by both upholsterers and furniture manufacturers to protect furniture from dust and damage whilst in storage and in transit. Specifically designed to cover sofas and armchairs, plastic furniture bags are an inexpensive way to protect what can be expensive items. Available in a range of useful sizes, furniture bag covers are manufactured from heavy duty polythene which will not easily rip or tear. Polythene furniture bags are simple to use and easy to store, making them an ideal way to protect your furniture during a house move or whilst decorating. Polythene Mattress bags are very commonly used in UK to Spain Removals, as they are a quick and easy solution to keeping your mattress cleans and protected during transit. A favorite of the removal industry when undertaking UK to Spain removals, Export Wrap furniture protection or Bubble Blanket as it is also known, is a protective wrap that can be used time and again to prevent scrapes, scuffs and gouges. Bubble blanket or Export wrap, is an excellent choice when moving long distances, or if you are entrusting your belongings to a third party carrier. A removal company will often use a third party delivery service when undertaking UK to Spain Removals. Export Wrap is durable and hard wearing; the perfect for items that are also going to be storage, it is also suitable for occasions where multi-trip packaging is required, as the material is durable enough to withstand repeat trips. Bubble washing machine covers are the fastest, simplest way to protect a washing machine from sustaining damage whilst in storage or in transit. Sold individually, a washing machine bag provides the best possible protection for your washing machines whilst moving home. Many removal firms use washing machine bags to prevent small dents occurring during transit. Wrapping all furniture before loading the removal vehicle prevents marking and scratching of surfaces by items or boxes. Many companies use transit blankets by using packing tape to secure the transit blanket to itself around items of furniture. Why use a Transit Blanket? Ideal for use with any furniture that might retain moisture or be susceptible to rust. When retained moisture evaporates in warm conditions it will condense if restricted in polythene. Water will stain wood and cause moulding, on metal it may cause rust. An alternative to Transit blankets are a quilted covers. Using quilted furniture covers during a move or while in storage is a great way to protect your furniture from rips, tears and stains. Covers are made of a quality performance woven fabric that's durable and even washable. The furniture covers for moving are constructed of a heavy duty moving blanket fabric and then a harder quilted outer shell. The cotton/polyester blend offers the perfect combination of durability and quality, without the stiff bulk found in other moving blanket fabrications. The covers are also finished with a colored binding that not only keeps the edges from fraying, this also denotes the size of the cover. the covers are almost made to measure with covers designed for 2 seater sofas, or washing machines etc. If you are considering relocating to Spain, one of the Cities you may have considered is Zaragoza. A removal to Zaragoza is a popular choice with expats, as the city offers a wide range of historical and modern places of interest. For those of you who may be interested in a removal to Zaragoza, we have outlined a bit more about the city and it's attractions. Zaragoza is the capital city of the Zaragoza province and of the autonomous community of Aragon, Spain. It lies by the Ebro river and its tributaries, the Huerva and the G�llego, roughly in the center of both Aragon and the Ebro basin. Deriving its namesake from the one and only Caesar Augustus, Zaragoza was once an ancient Iberian settlement, an important Roman colony, a thriving Muslim city and a cornerstone of the Catholic Spanish empire. Nowadays, Spaniards know it as the land of top-notch home-grown gastronomy like hearty stews, roasted or barbecued meats like ternasco (succulent milk fed lamb), and some of Spain's best tapas bars. Situated in the northeast of the country on the river Ebro, this ancient city has the fortune of being located between Madrid and Barcelona, Valencia and Bilbao. It is Spain's fifth largest city and is the capital of the immense autonomous region of Aragon. Diverse and outstanding natural beauty set the scene in this region, while the history here reads like an epic tale of a vast and varied legacy, evidence of which can be seen all over. You will find everything from pre-historic cave paintings, megalithic dolmens, emblems of the Roman empire such as walls, bath houses, markets and a 6000-seat theatre. You will encounter archetypal architecture that ranges from the unique Muslim-Christian Mudejar to Medieval, Gothic, Baroque, Renaissance and Modernism. Rarely seen remnants of the once flourishing Jewish communities in Spain can also still be found here, not to mention literally hundreds of fortresses, towers, abbeys, monasteries, medieval stone villages and castles. History is alive here and cultural tourism is at its best, allowing you to discover evidence on every corner of this country's most important moments. Noble, proud, generous, open and warm are some of the words often used to describe Zaragozans. They are a population known for their strong character and interest in the finer things in life and the city is famous for its folklore, local gastronomy, and landmarks such as the Bas�lica del Pilar, La Seo Cathedral and the Aljafer�a Palace. Together with La Seo and the Aljafer�a, several other buildings form part of the Mud�jar Architecture of Aragon which is a UNESCO World Heritage Site. The Fiestas del Pilar are among the most celebrated festivals in Spain. Religion has played a significant role in the shaping of Zaragoza's story, so it is not surprising that the countless celebrated cathedrals here have become the focal point of the city. The most famous is the magnificent Basilica of Pilar. One of Europe's (and the Catholic worlds) biggest and most important Marian Cathedrals, it is built on a site to which the Virgin Mary was said to have come in 40 A.D., in person and pillar in hand, to comfort the Apostle James on the banks of the Ebro river. Thousands of people flock here every year to kiss this blessed pillar, which remains inside today. Also inside are some beautiful frescoes by locally born Francisco Goya. To celebrate this magic moment of the coming of the Virgin, Zaragoza holds a week-long festival in October, packed full of processions, parties, concerts, food and fireworks. From 1018 to 1118, Zaragoza was one of the taifa kingdoms, independent Muslim states which emerged in the eleventh century following the destruction of the Caliphate of C�rdoba. During the first three decades of this period, 1018�1038, the city was ruled by the Banu Tujibi. In 1038 they were replaced by the Banu Hud, who had to deal with a complicated alliance with El Cid of Valencia and his Castilian masters against the Almoravids, who managed to bring the Taifas Emirates under their control. After the death of El Cid his kingdom was overrun by the Almoravids, who, by 1100, had managed to cross the Ebro into Barbastro, which brought Aragon into direct contact with them. The Banu Hud stubbornly resisted the Almoravids and ruled until they were eventually defeated by them in May 1110. On 18 December 1118, the Aragonese led by Alfonso I conquered the city from the Almoravids, and made it the capital of the Kingdom of Aragon. After Alfonso's death without heirs in 1134, Zaragoza was swiftly occupied by Alfonso VII of Le�n and Castile. The city control was held by Garc�a Ram�rez, king of Navarra, until 1136 when it was given to Ramiro II the Monk in the treaty signed at the betrothal of Ramiro's daughter Petronila and Alfonso's son Sancho. The wedding never happened, as Petronila ended up marrying Ramon Berenguer IV, Count of Barcelona. The marriage union was the origin of the Crown of Arag�n, and union with Castile would not happen for another 333 years, when King Ferdinand II of Aragon and his wife, Queen Isabella I of Castile, each took their respective thrones. 13th century Zaragoza was the scene of two controversial martyrdoms related with the Spanish Inquisition: those of Saint Dominguito del Val, a choirboy in the basilica, and Pedro de Arbu�s, head official of the inquisition. While the reality of the existence of Saint Dominguito del Val is questioned, his "murder" at the hands of "jealous Jews" was used as an excuse to murder or convert the Jewish population of Zaragoza. Despite a decline in the outlying rural economy, Zaragoza has continued to grow. The General Military Academy, a higher training center of the Spanish Army, was re-established on 27 September 1940, by Minister of the Army Jos� Enrique Varela Iglesias. During the second half of the 20th century, Zaragoza's population boomed as a number of factories opened in the region. In 1979, the Hotel Corona de Arag�n fire killed at least 80. The armed Basque nationalist and separatist organization ETA has been blamed, but officially the fire is still regarded as accidental. ETA carried out the 1987 Zaragoza Barracks bombing in the city which killed eleven people, including a number of children, leading to 250,000 people taking part in demonstrations in the city. This is a quintiessential Spanish city, with signs of its richly coloured past and kaleidoscope of cultures everywhere to be seen. It is a true sanctuary, off the beaten tourist track, and full of wonderful surprises. Classic and contemporary, this city may just be one of Spain's best kept secrets.